Jon Bailey and Chad Cheeney’s documentary “Mallethead,” from which this photo is taken, will be shown in Telluride’s Mountain Film over Memorial Day weekend. 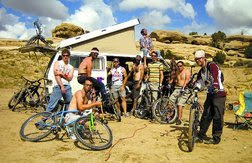 A 60-mile bicycle journey from Durango through New Mexico to Mancos for seven mountain-biking polo players became the basis for a 19-minute film called “Mallethead.” The film debuted last October at a mountain-biking festival in Durango and then played at the Durango Film Festival. An enthusiast saw the movie there and showed it to a key decisionmaker for Mountain Film in Telluride. The result is that the movie will be screened in Telluride over Memorial Day weekend. The “Mallothead” group poses for a photo. Not bad for local filmmaker Jon Bailey and his friend and movie-making partner Chad Cheeney. The guys have been playing bike polo for nearly a decade in Durango. They always thought it would be a good subject for a documentary, but hey, who has time to film when you can be whacking a ball with a homemade mallet from a mountain bike? Bailey and Cheeney decided a trip would be a way to force themselves to focus on the filmmaking. They had the idea for a beginning and an ending of their documentary, but not the middle. So, they just started interviewing their close friends and polo-playing buddies. 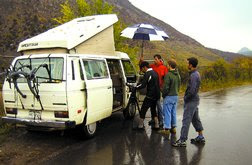 A cameraman shoots footage in a Volkswagon van. But, everyone was happy to talk about one another, and the film became an exploration of the lives and families of people who just happen to play bike polo. It’s about their personalities and what they bring to the game that builds a team. In other words, it’s real: Real life, real people, real passion for a backyard version of bike polo. Their version is fast with few rules. The most important is that a rider must make a full 360-degree turn before hitting the ball again. It isn’t the U.S. Bicycle Polo Association or American Bicycle Polo Association version; it’s not the kind played in urban settings in fenced-off areas. This is Colorado-style bicycle polo. In fact, it’s difficult for these guys to play against other bicycle-polo teams because they have their own rules for riding. Bailey and Cheeney are working on a DVD version of the film. But until it is available for purchase, the only way to catch another glimpse of this film shot in what Bailey called “random, dirtball places,” is to head up to Telluride. How bad can that be?